This polypropylene adhesive tape is the economical and reliable alternative to vinyl packing tape. The tough brown tape is ideal for securely sealing cartons and parcels. It works well at low temperatures and has high resistance to impact. 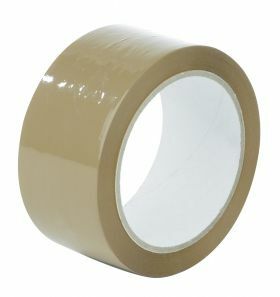 Our multi-purpose polypropylene brown packing tape is a low-cost alternative to vinyl adhesive tape. Although noisier to use, it is tough with high resistance to impact. Long-lasting and strong, our brown polypropylene tape also works well at low temperatures, making it invaluable in warehouses. This durable brown parcel tape is ideal for a wide range of general applications, particularly in mail rooms and packing stations dispatching cartons for shipping or transit. Our polypropylene packing tape in brown is 48mm wide and comes in rolls of 66m, supplied in packs of 6. Bulk buy, and the adhesive tape costs from just 52p per roll. This is not the 'economy' parcel tape many others are selling as a 'standard' tape - so you can expect great quality at an excellent price! A cheaper alternative to vinyl, our brown polypropylene adhesive tape tightly secures boxes ranging from light to medium in weight. Use it with scissors or with our parcel tape dispensers for quicker application. Although noisier than vinyl, this brown packing tape is tough and durable with high resistance to impact. The parcel tape works well in all temperatures, even the cold, so is especially useful in warehouses. Our reliable brown tape is perfect for sealing parcels and cartons for dispatch as well as for packing up boxes when moving office or house. A practical and cost-effective brown packing adhesive tape option, our brown polypropylene multi-purpose carton packing tape is great value for your money. It is even more economical if you buy in volume, with the 66m rolls of brown packaging tape costing from only 52p each if you order in bulk – and just £0.74 per roll for one pack of 6.